As a real estate agent in South Carolina, home buyers frequently ask me, "what is a CL-100?" When it comes time to buy or sell your home, this is an item you can't do without! Our humid climate makes for a perfect breeding ground for our least favorite insects - termites. This report is also known as a Wood Infestation Report (WIR) or termite report, CL stands for "clear letter." Receiving a “clear” report indicates there are no current termite infestations in your home. If your sale or purchase involves a lending institution, a CL-100 is a mandatory report in order to close. As a buyer or seller, you will need a "CL-100 clear" to declare the home structurally sound. Unless your purchasing your home with cash, this is for you! There are a few factors inspectors will look for during the home inspection that includes signs of termites, carpenter ants, carpenter bees, wood-destroying beetles, and wood-decay fungi. The concentration of these wood-damaging factors in the Lowcountry are very high due to our hot and humid climate. Another posing problem is that many structures in our area are constructed with white pine, an indulgence for critters like termites. If there is evidence of active wood-destroying fungi below the main floor (indicating a wood moisture content of 28% or above). Note: Fungus will only grow if there is enough moisture, so it is important to find the direct source of the moisture. Any visibly damaged wood below the main first floor of the home including columns, sills, door jambs, exterior stairs, and porches. The inspector should go under and around the structure to check for all of these circumstances. 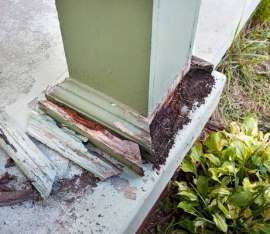 When damage is discovered, all surrounding material must be removed and replaced. The source must be eliminated and any disrepair rectified. It's important to remember that a CL-100 report is only valid for 30 days prior to a property closing. Termites can be treated and serious damage can be avoided if the home is covered by a "termite bond." This bond typically consists of a one time payment to a pest company. They will then handle periodic treatments throughout the year to keep your house free of pests. The company you purchase the termite bond from is liable for all damages and repairs, but be very careful about who you purchase the termite bond from. Not all companies are created equal! Not all of them provide the same warranties with their services. If you're planning to sell your house in the near future, here are several tips to protect your home. The best advice on combating termites is to never let them get started to begin with. Don't put off repairs and keep your termite bond current. This will help the process of obtaining your "CL-100 clear” and making sure the sale or purchase goes smoothly. You attorney will take care of ordering the CL-100 on your behalf as it must be within 30 days of closing. It is often a Seller expense but a smart Purchaser might want to incur the cost so they ensure it is done correctly. We have great qualified inspectors in our area that we trust and know that you will too.